This week’s book review is up the alley for many Couple Money readers. 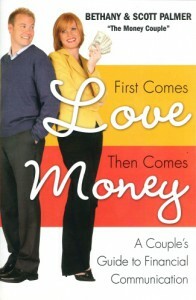 Bethany and Scott Palmer, also known as “The Money Couple,” have a new book out about financial communication. I think it’s a handy book to review as one of the biggest reasons marriages break down is due to financial problems. Some people mistakenly believe that if they brush over the topic, then they’ll avoid money arguments. That’s simply not true. It’s the lack of meaningful communication between spouses about finances that causes arguments. With that in mind, I hope some of you find this book review helpful. As you can see the focus is less about the numbers and more about the habits and communication. The Palmers noted that they could help families fix their finances over time, but if the underlying communication problem wasn’t fixed, the money problems came back. Besides eight chapters worth of information, the Palmers include more if you want to delve just a bit deeper and get some more tips on dealing with money as a team. The first section of the book encourages you to look at each other’s money personality and discover why conflicts happen. It ends with some case studies on different money personalities and the most common problems they have interacting with one another. The book seems to flow well from section to section and I do like how it goes from concepts to tips. Looking at the big picture before tackling the details seems more beneficial for most couples. My overall impression of this book is positive. I think couples who are having problems seeing eye to eye would benefit from reading and discussing the book. It’s meant to be a springboard for some honest communication.